A simple white sauce with garlic and a little sherry adds flavor to this tasty cabbage recipe. 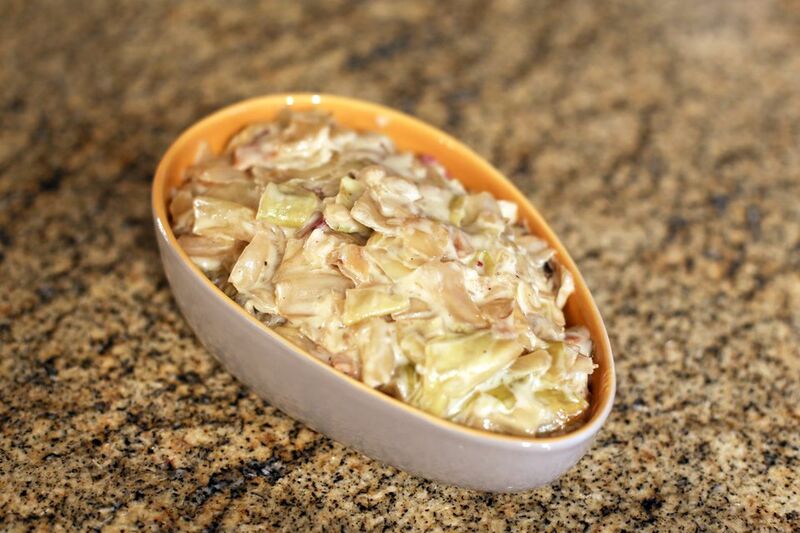 Cabbage and leeks make a delicious combination, and the creamy sauce makes the dish special. The cabbage and leeks are cooked in the slow cooker before the sauce is added, but they could just as easily be cooked on the stove top in a large saucepan or Dutch oven. Feel free to add about 1 cup of chopped onions instead of leeks. Put the chopped cabbage and leeks in the crock pot. Add the minced garlic, dry sherry or wine, and water (or use 1/4 cup of chicken broth). Dot with 1 tablespoon of butter; cover and cook on low for 7 to 9 hours. Melt remaining 2 tablespoons of butter in saucepan; add flour and stir until smooth and bubbling. Add cream or milk and cook over low heat until thickened. Add the mace and salt and pepper to taste. Mix into the cabbage and leek mixture. *To prepare the leeks, cut off the roots and dark green tops, leaving just the white and light green. Halve each leek vertically. Place them in a bowl of clean water and swish them to loosen any sand or grit. Slice the rinsed leeks crosswise and use in the recipe.